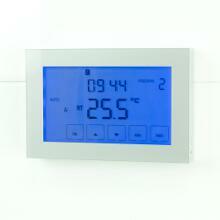 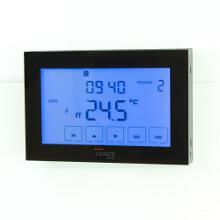 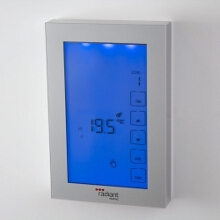 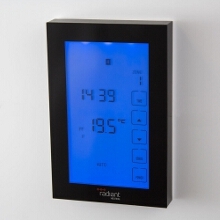 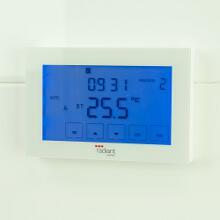 A Radiant Thermostat is an ideal and stylish option for controlling your electric under floor heating. 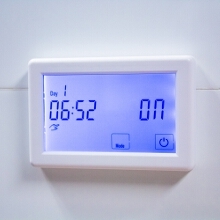 The blue backlit digital display not only looks great, but provides an easy way to set the on/off schedule twice daily plus the desired temperature. 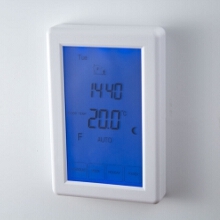 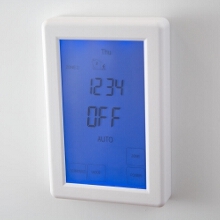 During the off period, this thermostat still enables you set a minimum temperature so you can maintain a base temperature or if you have solar you can use this to trickle power from your solar panels to the floor heating to maintain a higher temperature throughout the day for little or no cost. 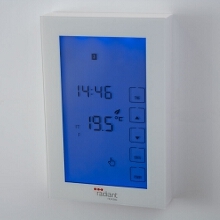 We also have a Dual Timer & Thermostat option which is perfect if you are installing under floor heating and a heated towel rail. 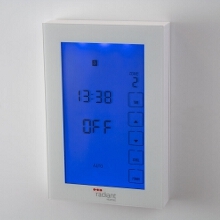 The Dual controller has two zones, one for the under floor heating and another for the heated towel rail allowing you to set independent schedules for each. This single combined unit removes the need to have two different units mounted on the wall in your bathroom, instead this combined digital touchscreen controller does both.